You are here: Home / Desserts / Pies and Tarts / Vegan S’mores Pie – No Campfire Needed! This gluten-free and vegan s’mores pie topped with a homemade vegan marshmallow fluff is sure to be your new favorite vegan no-bake summer dessert! S’mores are messy and kind of a pain to make. They fall apart when you try to eat them. The chocolate never really melts from the heat of a marshmallow alone. Vegan chocolate bars and marshmallow are hard to find. If you’re gluten-free, there are few options for graham crackers. You don’t always have a campfire to make them. However, chocolate, marshmallows, and graham crackers are a delicious flavor combo that you shouldn’t miss out on! So… That is why I created S’more Pie! 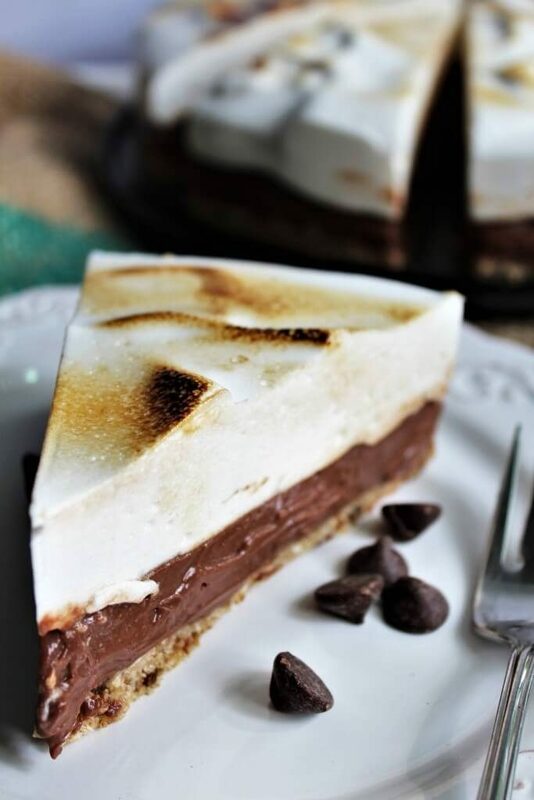 Creamy rich chocolate layered between a graham cracker crust and fluffy marshmallow topping! You can even “toast” the top with a culinary torch (crème Brûlée torch) for an authentic s’mores taste! 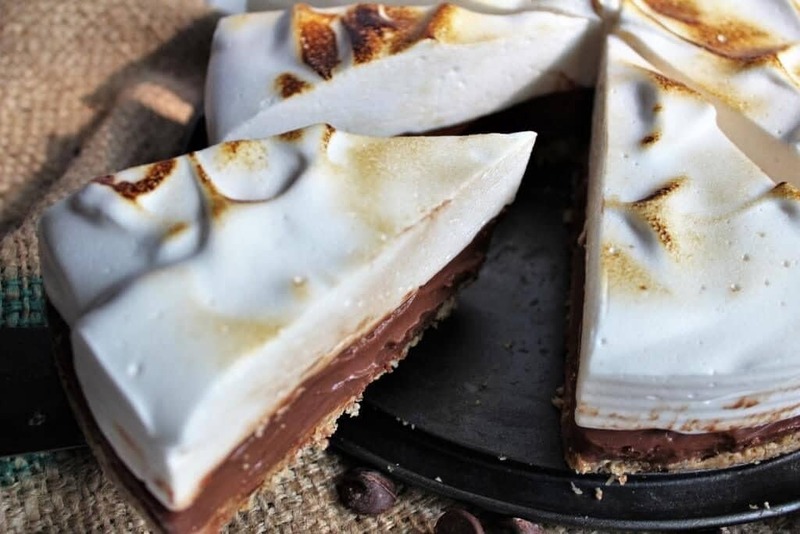 How do I make this vegan s’mores pie? Start by making a graham cracker crust. You can use a pre-made one (most are vegan) or make your own by following directions on the graham cracker box and substituting vegan margarine or my vegan butter for butter. Since my family is gluten-free, I make a homemade gluten free and nut free version out of gluten free oats, coconut sugar, and dates! How do I make vegan chocolate cream pie filling? Simply put silken tofu, chocolate, sugar, melted coconut oil, and vanilla in a blender or food processor and turn it on. Mix for about 1-2 minutes until it magically turns into creamy chocolate deliciousness! Then, pour it into your graham cracker crust. Spread out the chocolate cream filling and then put it into your refrigerator to set. How do you make vegan marshmallow topping? This pie topping is pretty magical. It uses aquafaba (the liquid from a can of chickpeas) to make a light and fluffy marshmallow fluff! Put the aquafaba in a mixing bowl with the cream of tartar and mix on high for 6 minutes until very fluffy. Add some vanilla extract and whip for 3 more minutes until it is white again and it forms very stiff peaks. How do you get the aquafaba firm like a marshmallow? The secret to turning this whipped aquafaba into a marshmallow consistency is agar agar. (It is a vegan gelatin like powder made of seaweed). Make sure to use agar agar powder and not the flakes. I find the best price on it at my local Asian market or on Amazon. In a small saucepan, combine water and agar agar and bring to a boil. Boil the water and agar agar for 3 minutes. Add sugar and boil for another 3 minutes stirring constantly over medium-low heat. (Be careful not to burn or caramelize the sugar). Turn off the heat and immediately pour the hot sugar mixture into the beaten aquafaba. Add this mixture slowly while beating aquafaba with a mixer. This will turn the fluffy white mixture a little shiny. Note: It will start to firm up quickly once it cools down, so just mix it for about 30 seconds and then pour it over your pie. Take your chocolate pie out of the refrigerator and pour the marshmallow mixture on top. Use a rubber spatula to spread it evenly on the top. Refrigerate your vegan s’mores pie for about 2 more hours to set completely. How can I “toast” the marshmallow topping? The best way is with a culinary torch. (I do not yet own a culinary torch, so I use my husband’s welding torch, which works too, but it is just heavy and harder to hold then a small kitchen torch – and we won’t talk about the cleanliness of it). Simply, turn on the flame and run it back and forth over the pie holding it just far enough back that the end of the flame just barely touches the marshmallow topping. Brown your topping to your taste. I have also tried broiling it in the oven to “toast” the top, but that wasn’t easy, and it heats up the whole pie, which you want to stay cold, so I highly recommend a culinary torch. 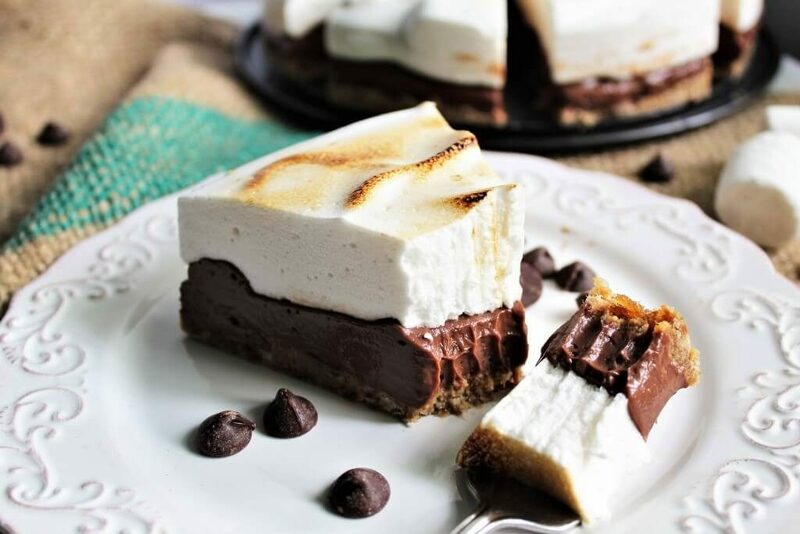 The only thing better than s’mores is… s’mores pie! 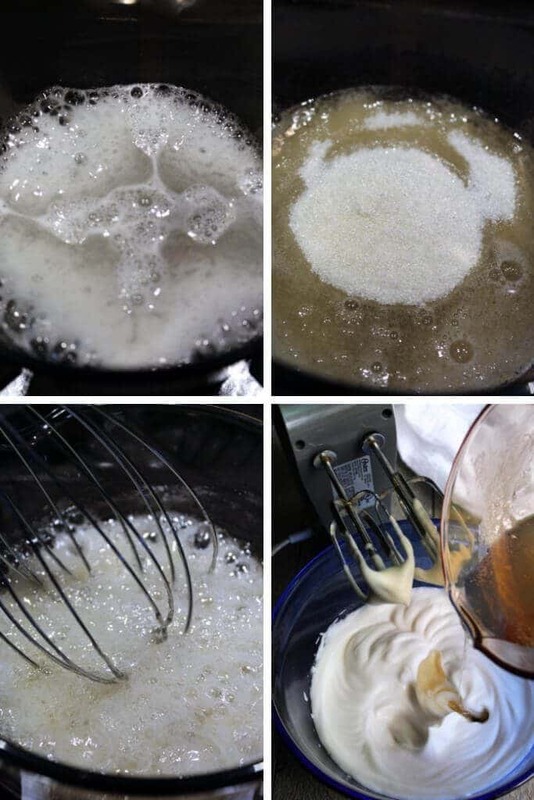 Want more amazing recipes using aquafaba? Follow me on Instagram for daily vegan inspiration and clickable links to all my recipes! 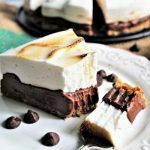 A graham cracker crust layered with chocolate cream pie and topped with homemade vegan marshmallow topping! Follow the recipe for my gluten free graham cracker crust or use your favorite recipe or a pre-made crust. 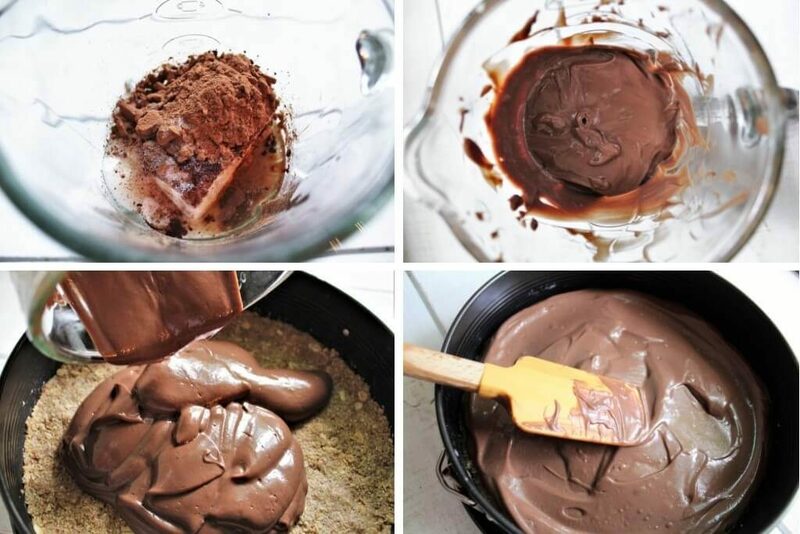 Put all the ingredients for the chocolate cream pie filling into a blender or food processor and blend until creamy. (You may need to stop a few times and scrape the edges). Pour the chocolate filling into the graham cracker crust and smooth it out. Place the chocolate pie in the refrigerator while you make the marshmallow topping. Pour the liquid from a can of chickpeas into a medium sized mixing bowl. Add cream of tartar and beat with a mixer for 6 minutes until very it's very fluffy. Then add the vanilla and beat for 3 additional minutes. (You will beat the aquafaba for a total of 9 minutes). In a small sauce pan, combine the water and agar agar and bring to a slow boil. Boil the water and agar agar for 3 minutes and then add the sugar and slowly boil for an additional 3 minutes while stirring constantly making sure not to burn the sugar mixture. (The agar agar mixture will boil for a total of 6 minutes). Pour the agar agar and sugar mixture slowly into the fluffy aquafaba while beating with your mixer on low. Beat in the sugar mixture on low for about 30 seconds until it is all incorporated and it becomes slightly shiny. Immediately top your pie with the marshmallow topping, spreading it out evenly over your pie. Refrigerate your pie for an additional 2 hours or more to allow it to firm up and set completely. Once it has set, you can use a culinary torch to "toast" the marshmallow topping. 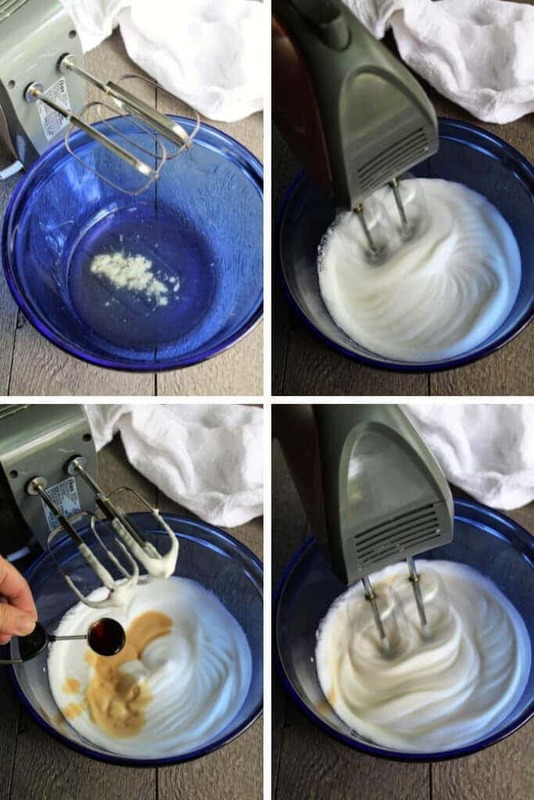 Make sure to mix the aquafaba for a total of 9 minutes to ensure that it is very fluffy and will hold its form. Once you add the sugar to the agar agar mixture stir constantly to ensure you don't caramelize or burn the sugar. Work quickly once you have made the agar agar mixture. It will firm up and set once it cools off. Refrigerate for at least 2 hours to set. It will firm up slightly more the longer it sets. You may have a little marshmallow fluff left over depending on how thick you want the topping. You can store this in the fridge and use it for peanut butter and fluff sandwiches or ice cream topping! This is my new favorite pie!